This book is damn near close to perfect. 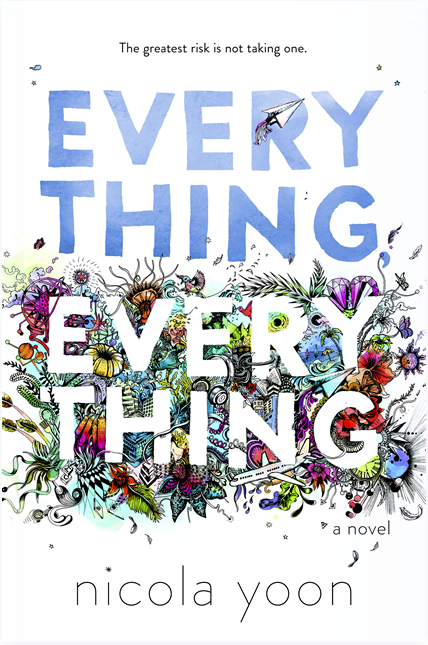 I am in awe of first time author Nicola Yoon and her extraordinary talent. It is rare I find a YA book that I truly like, and this was one of those books. From the time I began reading this, I could not put it down. The main character we follow is Madeline, a teenage girl with an extremely rare disease (SCID, Severe Combined Immunodeficiency) that makes her allergic to everything in the outside world. She has lived completely indoors since she was young in a kind of artificial, “bubble-like” existence: filtered air, specially cooked foods, and no outside visitors. The only people she communicates with are her mother, her doctor, and Carla, her nurse. Madeline has resigned herself to her housebound fate until she glances out of her window one day and discovers a family moving in next door. She is immediately drawn to the teenage boy living there, Olly, and from there her entire world changes. I won’t say any more about the plot here because this book will not be released until September 2015 and some of you have to wait for it. But I will say that this book was throughly engaging for me. The romance wasn’t cheesy like a lot of YA books, but completely organic and it fit perfectly in the story. There are also charts, graphs, and illustrations that added a certain special touch to the book that teens will enjoy. I’m giving this five stars. It’s not often that I do this, but I actually stayed up until 3:20 am on a school night finishing this, and I don’t regret a moment of it. Beautiful, beautiful book! this definitely sounds like something I need to read. Great review! Yes, please do! I LOVED this book! Next Next post: A kinda sorta update post.